The IceCube™ functions with Peltier plates technology to cool down to -70 °C or -50 °C using only tap water and electric power. The reaction channel is a PTFE tube with variable lengths, embodied in a metallic plate fixed on the Peltier plate. The starting/quenching materials are delivered continuously into the temperature-controlled reaction zones by the pumps and the product is collected in the end in a vial, flask or vessel. The system composed by 4 modules: Ozone Module, Pump Module, Reactor Module and Control Module. This makes the system highly customizable, the modules can be configured or purchased separately to match the arrangement that suits the selected application. The Ozone Module gives you a safe and efficient way of generating ozone from oxygen. The oxygen amount is precisely controlled through the built-in mass flow controller. The system can also be used as a powerful and compact standalone ozonizer. The Reactor Module is a very versatile reactor capable of controlling even extremely exothermic reactions safely and simply. Composed of two reactor plates with Peltier heating/cooling, the main zone works from -70 °C or -50 °C to 80 °C and the secondary from -30 °C to 80 °C. The reaction line is made of PTFE embedded in a pair of aluminium plates that allow many different volumes and arrangements for wide chemical compatibility. The system can be configured for 2, 3 or 4 reactants in one sequence. Difficult or dangerous reactions such as lithiation, azide generation or ozonolysis can be performed and quenched immediately eliminating the risk associated to dangerous intermediates. The Pump Module consists of 2 rotary piston pumps, which have good chemical compatibility. The pumps are connected to two 3-way valves, which control the path of reactant or solvent through the reactor. 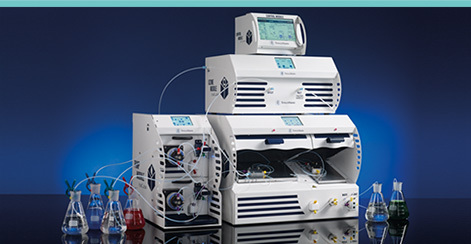 Single or multiple pump modules can be purchased depending on the need of the chemist. The Control Module enables the control of all the above parts as a whole system via a touch screen interface. What is the basic setup of the system? Can I use more or less pumps? Yes, and they can be controlled by the Control Module as well. Are there any preferred configurations? Can I add my own configurations? Yes, you can build your own configuration and introduce it in the software to be able to control each of the parts and monitor the parameters in real time through the Control Module. How easy is it to make the system ready physically for these configurations? You only need to include a mixer and other PTFE tubing to supply either a liquid or a gas, which takes only a few minutes to do. What happens if a blockage occurs? The blockage can be washed out slowly, or since PTFE tubing is utilized, it can be easily replaced. What does the reaction area look like? You can use either 1/8” or 1/16” PTFE tubes embedded in a pair of plates. The base plate has grooves so placing and changing the tubes in the coil takes only a few minutes. How can you vary the reaction zone for scaling up? You can change to another reaction volume easily in seconds. The length or internal diameter of the reaction line may be changed by swapping over reactor plates. What solvents can be used? All the wetted parts of the system are made of PTFE, which can tolerate even strong acids. Can I perform reactions which require inert conditions? Copyright © 2018 ThalesNano Inc. All rights reserved!